By Ryan Whitwam on April 9, 2018 at 10:20 a.m. Some of the most popular keyboard switches are tactile like the Cherry MX Browns and Clears. That means there's a "bump" as you press the key, but no clicking mechanism. 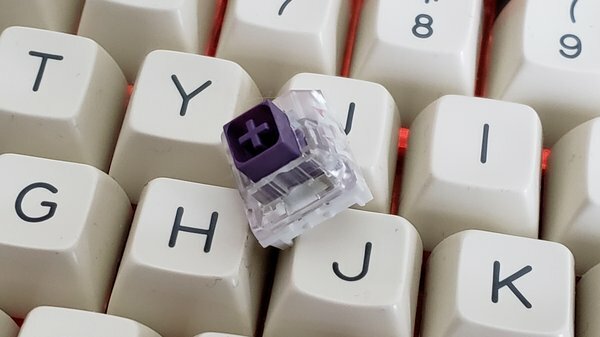 As you dig deeper into the custom keyboard community, you'll come across tactile switches with varying properties like Zealios and the Input Club Hako series. Some of these are pretty tactile, but new Box Royal switch from Novelkeys and Kailh is probably the most tactile switch I've ever used. It might not be for everyone, but it's fascinating nonetheless. 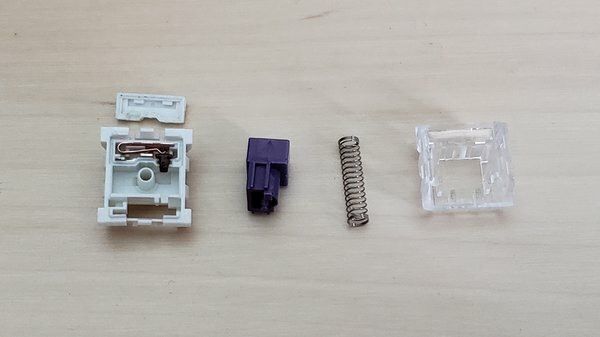 On the outside, the Box Royal looks like similar Kailh-manufactured switches we've seen recently. The stem has a square shape with a standard Cherry-style cross in the middle. Thus, it'll work with all Cherry-compatible keycaps. The opening in the housing makes it compatible with in-switch LEDs as well as SMD LEDs on the circuit board. The stem color is dark purple, rather like Zealios. Inside, the Royal has the usual Box assembly protecting the metal contacts. When the stem moves down, it presses a plastic nub that actually moves the contacts inside the Box portion. See below for what the switch looks like disassembled. The shape of the internal stem and the spring weight give the Royal its unique properties. 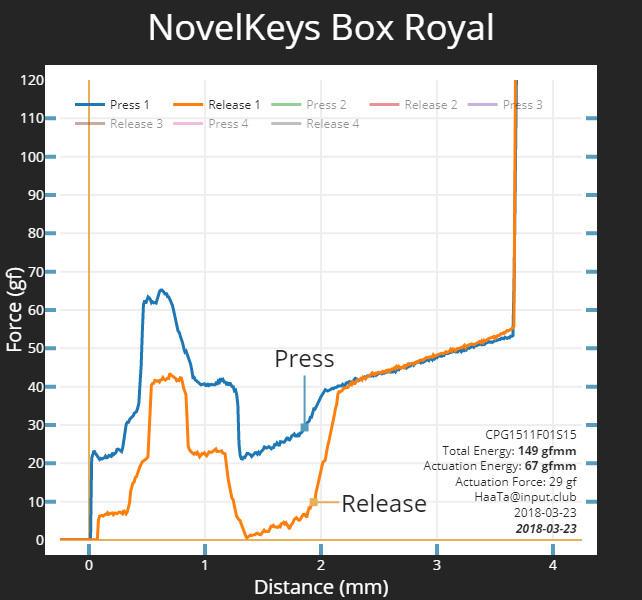 As you press a Box Royal, the force required to get over the tactile bump is extremely high—65 grams. That's right up there with the MX Clear, but the tactile bump is less round on the Box Royal. It sort of "steps down" through several smaller bumps before the spring force ramps back up as you get closer to the bottom of the switch. However, it bottoms out at just 55g. That's lighter than the tactile peak. On the return stroke after you release the key, Box Royals experience the same heavy tactile bump. 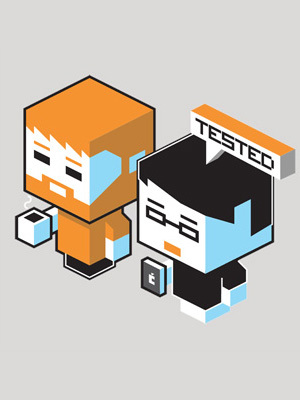 In fact, they have a nearly zero force reading at the start of the bump. That means the spring is almost not strong enough to return the switch all the way up. I haven't seen the switch actually get stuck, but the bounce back is a little slower than other switches. This is a trade-off if you want a sharp, heavy tactile bump. Because the Box Royal bottoms out with less force than it takes to clear the bump, you're almost guaranteed to bottom out the switch. That could make Box Royals undesirable for lighter typists who don't want to hit the bottom. However, a heavy typist will still feel the bump quite well even when hammering the keys. The feel of a Box Royal actually reminds me of several versions of the old Alps switches. These classic switches have heavy tactile bumps, then they fall through to the bottom on the back half of each press. Novelkeys will sell the Box Royal in the coming week—production is currently on track to ramp up in May. The switches will sell for $0.50 each. So a smaller 60% keyboard will cost you $30-40 to outfit with Box Royals.